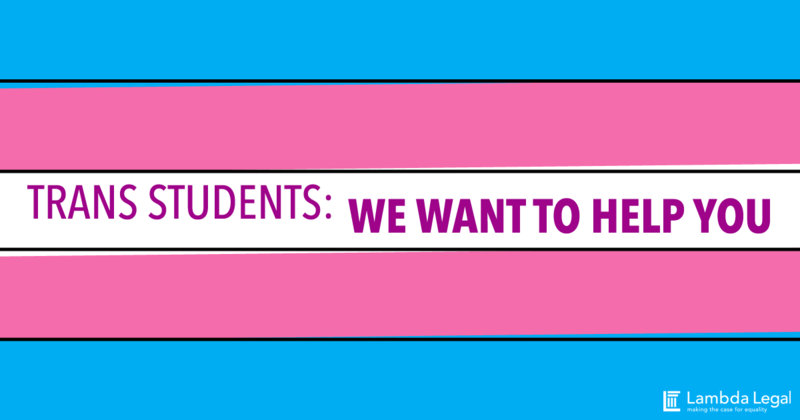 Are you a transgender student? You have the right to be safe and fully included at school. That means being recognized as who you are in all aspects of your life – from the classroom, to the restroom, to the locker room. Are you being denied access to those spaces because you’re trans? Are you being forced to use a separate restroom or changing space, away from your peers? Does your school refuse to honor your declared name and pronouns? Are faculty or staff outing your trans status? We have your back. And we want to hear from you! Separating trans students from their peers by forcing them to use separate restroom and locker room spaces is demeaning and can be emotionally damaging. It also violates the law. You can take action to protect your rights. Check out our Know Your Rights: Transgender and Know Your Rights: LGBTQ Teens and Young Adults sections or fill out the form below. Is it okay for us to call you?